The NFL certainly did the Cleveland Browns no favors when it came to laying out the 2014 schedule. The Browns open the season in Pittsburgh, where they haven’t won in more than a decade, followed by home games against New Orleans and Baltimore. The team will also finish the year by playing four of their final six games on the road. 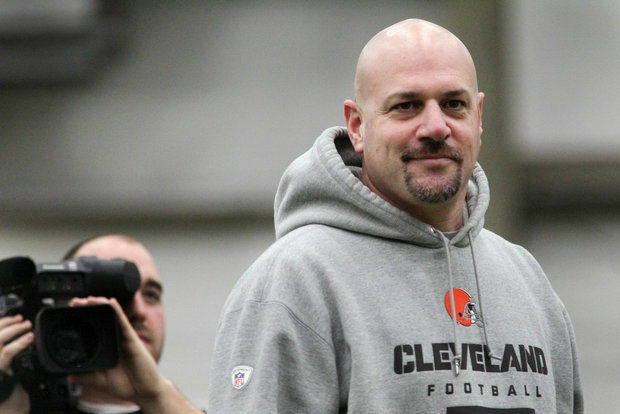 Welcome to the NFL, head coach Mike Pettine! “Browns at Steelers in Week 1, in your first game as an NFL head coach? It doesn’t get any better than that. I love this division,” Pettine said in a team statement. The Browns will take their bye in Week 4, a bit earlier than you would normally like, but that actually couuld work to the team’s advantage. With a new coaching staff in place, having the bye come a wee bit early in the schedule will give the coaches a nice opportunity to review three games worth of film and adjust accordingly. The Browns will be done with the Steelers by Week 5. The lone (for now) prime time game, a Thursday night game on Nov. 6 in Cincinnati. Week 5 on the road against Tennessee and former defensive coordinator Ray Horton. Week 7 at Jacksonville, giving Alex Mack a look at what he missed out on when the Browns matched the contract offer the Jaguars made to Mack. Week 13 at Buffalo, where Pettine and defensive coordinator Jim O’Neil worked in 2013. Week 14 against Indianapolis, the homecoming for former Browns Trent Richardson, D’Qwell Jackson and coach Rob Chudzinski. We know, as a Browns fan, we are supposed to be outraged at the news that former quarterback Bernie Kosar will no longer be in the TV booth for preseason games … but we’re not. Kosar, while knowledgeable about the game, is not a very polished broadcaster and is, at times, difficult to listen to. It’s only preseason, sure, but that doesn’t mean that anything should go. This being the Browns, though, it has become a thing. The Cavs just closed out the worst four-year stretch since the Ted Stepien years and no one cares. But the Browns reassign an employee and the mob is ready to march on Berea and silly online petitions are popping up to keep Kosar on the air. In a statement on Thursday, Kosar blamed the move on the fact that he slurs his speech, a result of numerous concussions suffered during his playing career. 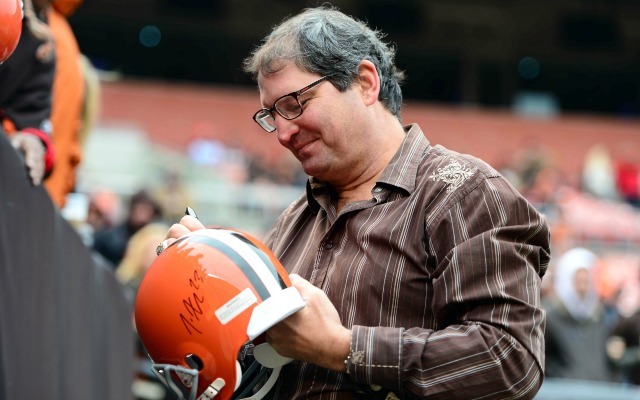 “I was informed yesterday by the Cleveland Browns and WKYC that I have been replaced as a 2014 preseason game day color commentator I believe that this decision stems from my slurred speech impairment, which is a direct result of the many concussions I received while playing in the NFL,” Kosar said. “This is very unfortunate, as I believe my football acumen and ability to describe what is happening on the field, has been well received by Cleveland Browns fans. With the ailments that Kosar admits to suffering from, is the broadcast booth really the best place for him? And it is not as if the Browns are throwing Kosar out on the street. The team is reportedly trying to keep him within the family by discussing roles on the team’s website and their various radio programs – a fact overlooked by “the Browns fired Bernie!” mob. Kosar may also still be a part of the preseason telecasts, just in a pregame role. For their part, WKYC is sticking to their decision. Kosar is a fan favorite, primarily because he represents the last good times for the franchise. But that shouldn’t mean the team can never make a change or redefine his role within the organization. Much like how it was time to find Jim Brown a new role that better suits him, the Browns are looking for a better alternative to Kosar. The important part in all this is that Kosar get the kind of help he may need. Browns fans need to keep this in perspective. This isn’t Stepien firing a professional broadcaster in Joe Tait because he criticized the team. This is a former player being moved out of a position that he may no longer be competent at. Let’s try to not make this out to be a bigger deal than it is. … after beating the Kansas City Royals on Thursday, the Cleveland Indians have suddenly won four-out-of five. The Tribe won on Thursday behind a complete game from Corey Kluber, who shutout the Royals on four hits while striking out 11. 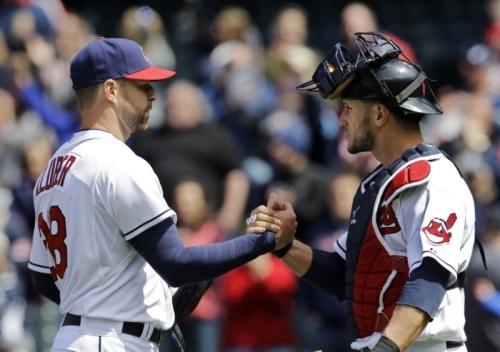 He topped off a good week from three-fifths of the starting rotation, as Justin Masterson gave up just two earned runs and struck out six in his start, and Zach McCallister matched Masterson’s effort with his own six-inning, two-earned-run performance. In his last three starts, McCallister has worked 19.2 innings, giving up just four earned runs and striking out 13. The win evens the Tribe’s record at 11-11, leaving them just 1.5 games out of first place. It is kind of amazing the Tribe has been able to keep the ship mostly afloat, especially when you consider the struggles of some key players, most notably Carlos Santana and Nick Swisher. Santana’s numbers are simply brutal: an .045 batting average over the past seven days, three hits in his last 37 at bats over the past 10 games and a .137 batting average on the season. As for the Tribe’s $15 million man, Swisher is currently 14th among A.L. first basemen in batting average and slugging percentage, 12th in on-base percentage and 15th in OBS. Then their is Danny Salazar, who has only made it into the fifth inning in one of his four starts (his first) and is currently carrying around an ERA of 7.85. Salazar is scheduled to start Sunday in San Francisco, which could turn into his last big-league start for a while if he doesn’t get things turned around. The Tribe has been able to figure things out well enough so far, leaving the team in not a bad position, all things considered, as they head out for a six-game West Coast trip against San Francisco and the L.A. Angels. NFL teams have until May 3 to pick up the fifth-year option on draft picks from the 2011 draft. While only a handful of teams have made the move so far, most notably Cincinnati picking up the option on A.J. 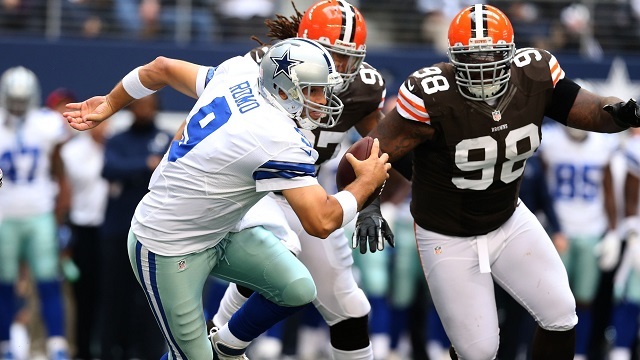 Green, it’s a little bit surprising the Browns haven’t done the same with defensive tackle Phil Taylor. Taylor started 15 games last season, finishing the year with 57 tackles and two sacks. He seems like the type of player that would fit in well with Pettine’s defense, and at a cost of just a little under $6 million, would not hurt the team’s salary cap. So it would be a surprise if the Browns don’t use the option, but it is a situation worth keeping an eye on as we get closer to the deadline. Liverpool’s title quest may have just gotten a bit easier. With Chelsea’s title hopes fading after last weekend’s loss to Sunderland, and a midweek Champions League game looming, Chelsea manager José Mourinho has made the decision to go with a younger lineup for Sunday’s game against league-leaders Liverpool at Anfield. Chelsea was already going to be without Petr Cech and John Terry due to injuries, and Mourinho is expected to field a lineup of players who are not eligible to face Atlético Madrid on Wednesday. As for Liverpool, Daniel Sturridge hopes to be back on the field after missing last week’s game against Norwich City with a hamstring injury. Liverpool has won 11 consecutive matches and, with three games left, are five points clear of Chelsea and six points in front of Manchester City, who has a game in hand. The Reds have locked up a Champions League spot for next season, and are just seven points away from winning their first league title since 1990.